The Irish Ladies Golf Union celebrated its 125th year with a special dinner event at Elm Park Golf Club over the weekend. 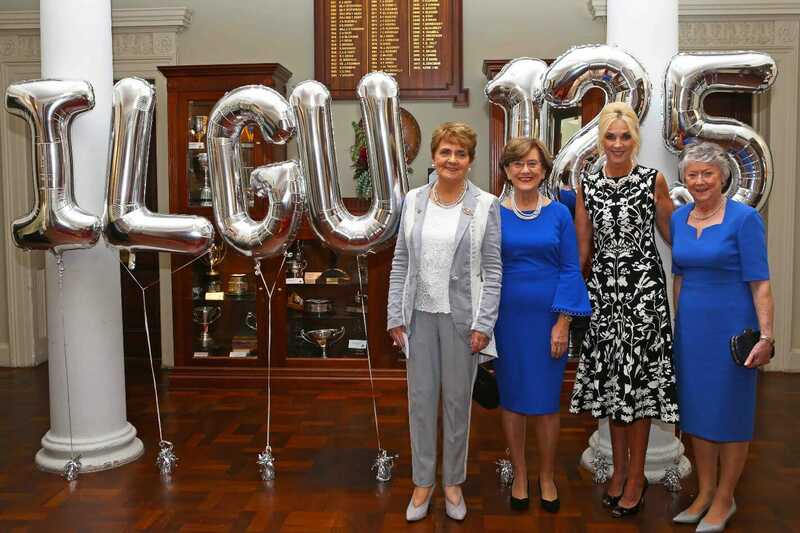 Hosted by Irish golf journalist and CNN broadcaster, Shane O’Donoghue, the evening fittingly paid tribute to the people who have taken the ILGU through the past 125 years to the powerhouse organisation that it is today. With over 200 people in attendance, it was a who’s who of ILGU, past and present, with volunteers, past Internationals, Irish Champions, Curtis Cup stars, representatives from our founding clubs, Gillian Kirkwood – President of the LGU/R&A, representatives from the GUI such as Iggy and Jim McGovern, and Gillian Burrell – Captain of the PGA in Ireland – it truly was a turnout worthy of such a remarkable occasion. It was a night of nostalgia, thanksgiving and laughter as emcee Shane spoke with Elaine Bradshaw, Ada O’Sullivan, Kay Keating and Laura Webb to relay stories from times, old and new. To further mark the occasion, copies of Ivan Morris’ book – A History of Women’s Golf in Ireland were proudly perched on each table with some even given away as prizes. Ivan was unable to make it on the night but the book is a must read and a humorous tribute to the great work carried out by women’s golf over the last 125 years. There was a surprise announcement also, of particular shock to Elaine Bradshaw and Roma English who were presented as Honorary Life Members on the night much to everyone’s delight – congratulations ladies! “On behalf of myself and the 34 ILGU Presidents who have come before, I extend a special welcome to the volunteers, without whom the heart of the Union would be lost. I wish to thank each and every one of you here tonight for the time and dedication you have given to the development of women’s and girls’ golf in this country. Each word Noonan delivered was worthy of a quotation but with the space we’re allotted there’s only so much we can pull! Her message was one of gratitude, echoed throughout the evening and the magnitude of just how far the ILGU has come wasn’t lost on Noonan either. Here’s to the next 125 years. If only we could live to see it!